This is a far more complex question than you might ever imagine. Essentially Tofu will taste like whatever you want it to taste like, depending on how you prepare it. But if you want to know what tofu tastes like on its very own, we will have to dig a little deeper into tofu and exactly what it is. If you haven’t tried tofu before, or maybe you have but really didn’t get a sense for it, then you’re definitely not alone. It’s one food item that brings a bit of mystery when you talk about how it tastes. Sometimes it gets a bad rap. But for those of us that are familiar and cook with it, there is a whole other world open to our taste buds, not to mention an extra healthy body. We promise tofu can taste amazing if done right. Let’s discover more about it and how it can go from bland to downright mouth-watering. The very basic answer to this would be tofu is the curd from soybean milk. Soybeans are a legume native to East Asia and are extensively grown for its numerous uses. The beans itself are edible but are used as the primary ingredient when creating tofu. Tofu’s origins are shrouded a little with some mystery. There are a few origin stories, but it does seem widely thought that tofu originated in China sometime around or before 200 BC. This tell us that tofu as a high protein food has been used for well over 2000 years, and it could have even been a lot longer than that. It is thought that the tofu may have been founded purely by accident when trying to add sea salt to a soy puree, which has a natural coagulant, nigari, and curds would have formed, or by leaving the puree to stand in a warm place, helping lactic acid-producing bacteria to make enough lactic acid to create the curds. Tofu is the most unfermented soy products eaten around the world. From Japan and Korea to Indonesia and India, you’ll find it in traditional dishes. When starting the process, you would wash your soybeans and then let them soak overnight until they get to about twice the size they were originally. Drain the beans and then rinse them off. You can then put them into another large bowl, add some water, and then roll the beans between your fingers. This will remove the skins of the beans which will float to the surface of the water, and you can remove them easily. Give the beans a good rinse again. Then you would need to put the beans into a blender. Add water to the blender with the beans and give them a good blend. Make sure that the final result is a smooth texture to be sure you don’t have lumps, or your beans are not fully blended. Keep blending until you are certain there are no pieces of bean left. This can take up to a minute and possibly slightly longer to be sure it is blended enough. Once everything is blended, you can transfer all of it to a large pot. You will need to bring the processed mixture to a boil. Be careful as this can boil over pretty easily. Sir frequently and boil for about 20 minutes. Once you have everything to a boil, you would then strain out the soy paste or what is known as okara. Use cheesecloth and press as much of the milk out as you can as this milk is what you will use to make your tofu. You will have to heat up your tofu again. Take some Epsom Salt and dissolve it in some warm water. You could also use lemon juice here if you prefer more natural ingredients. Remove the milk from the heat and then slowly stir in the salt mixture or the lemon juice. After sitting for 5 to 10 minutes, the curds will separate from the remaining liquid. Remove the curd from the liquid and then use your cheesecloth again and place into your colander. Use a plate or other such object and press down and leave some weight on the top of it, then let it sit for about 20 minutes. Voila! Tofu! There are many more in-depth recipes on how to make tofu online, but this basic outline is to give you an idea of exactly what goes into tofu, which really is a lot of nothing but soybean. So what does Tofu taste like? Tofu on its own is pretty tasteless as the heating process takes out a lot of the bean, but it can have a slightly earthy taste to it. Fact-of-the-matter is that we don’t really buy or use tofu for its flavor or as a snack food that we can crunch in front of the TV or trying to figure out the answer to the question, how do I put parental control on my iPhone? Tofu is generally considered something that is added to a meal for additional protein and as a meat supplement in our meals. Vegetarian eaters rely on this as a staple ingredient in their diets. The bonus is tofu has amazing flavor absorbing properties so you can prepare your tofu in several different ways or use different types of tofu to create a full-on eating experience. So what kinds of Tofu are there then? There are two primary types of tofu, silken and regular. Regular can be broken down into several densities. Silken tofu is pretty much undrained and unpressed tofu curd. This tofu has the highest water content of all the types of tofu and would have a texture or consistency of custard. Silken can be labeled as soft, firm, or extra firm. Silken tofu works best in foods that are more creamy in nature such as smoothies or deserts, but also can be used in puddings, sauces, dips, dressings, and spreads. Because of its more watery properties, it’s going to integrate more with whatever it’s mixed with. Silken tofu taste therefor, may be hard to discern as it’s more about texture. The flavors of what it’s blended with will dominate and won’t taste the tofu per se. You can even use silken tofu in lieu of eggs for your favorite baking recipes to give that bit of added protein without the calories or the cholesterol, or if you have an egg allergy. Honestly, you won’t even detect a difference in taste when you use the replacement tofu. It’s a little like magic. Check out this healthy chocolate brownie recipe that uses silken tofu instead of eggs. Regular tofu comes in several different densities, soft, medium, firm, extra-firm, and super firm. And to state the obvious, each density of regular tofu tastes alike if you were to chew on it right out of the package. This is similar to silken but still goes through the curds and whey process, unlike silken, which goes through a steaming process. The soft variety can taste good when used for deserts and other creamy types of recipes but doesn’t blend as smooth as silken does. Medium is still quite soft but has enough hold that it can be picked up with chopsticks if delicate enough. Medium tofu tastes wonderful in soups like a miso soup where it can absorb the taste of the broth quite easily giving you enriching flavors in each bite. You’ll find that medium tofu tends to be used in traditional dessert recipes like Hiyayakko. Firm tofu is quite common when it comes to cooking and Asian stir fry. It works best when you want your tofu to absorb flavor and hold its shape for presentation but will easily break apart or crumble nicely when chewed to give you that full-taste experience. This tofu is great at holding its shape and is the perfect density for pan-frying, deep frying and more. It is quite common to bake this type of tofu or even grill it on a BBQ grill. It can also be crumbled and will have the consistency of ground meat. You can even cook it in similar fashion in patties, in lasagna or even spaghetti sauces. Again, the intense flavors of those sauces will infuse nicely into the tofu making you forget you’re even eating it. Another example where tofu is taste “vehicle” and not the thing you taste itself. This tofu is pretty much like a block of cheese. It is super dense and will have the highest protein content of all the different types of tofu. There is very little water content so it can be dried out quickly if you are baking or grilling on high heat. This type of tofu tends to be good for those new to cooking with it because it is so easy to handle and cook with. It is essential to know that the denser the tofu is, the more difficult will be to infuse with flavors. When using extra or super firm tofu, if it is not cooked correctly then it may end up dry and flavorless which can turn you off if you’re trying tofu for the first time. You won’t taste the tofu, but there’s something to be said to food that lacks any kind of tasty appeal. You won’t really know what tofu can taste like if a bad recipe of this stuff is your first encounter. So how to cook tofu to taste good? Tofu is one of the most versatile foods out there, and it is also super healthy for you. You can’t saying this about a lot of foods. There are infinite ways of cooking tofu, limited by your own imagination in the kitchen, and you can be assured you will find any recipe you can think of online with an easy search. Let’s take a quick look at four basic and everyday ways of cooking tofu to get the most out of flavors and textures. In other words, this is how you to make tofu taste great! Consider what you want to make first and then choose the type of tofu that best suits what you are cooking. You would not want to get silken tofu and then try and kabob grill it as that just won’t work. Think about your end result and then figure out the best density tofu for your dish. Tofu contains water, sometimes a lot of it. It is a good idea to get as much excess water out of your tofu before you begin cooking as it can affect the taste in the end. You can press the tofu before you start your meal so when you are ready to actually cook, the tofu is also ready to be cooked. To press tofu, you want to take your block of tofu and place it between some paper towels to absorb the extra water. Place something heavy on top of the block such as a large tin can or a cast iron skillet or even a good size cookbook. Tofu should be pressed for about 20 minutes before you consider cooking with it. You are preparing it for the best taste. If you skip this step, don’t worry – depending on how you cook it, excess moisture will be released as steam. Marinating is a pretty common practice when it comes to meats, and so it is also perfect when cooking with tofu. Since tofu has little to no flavor to it, originally it is perfect for marinating because of its super absorbent nature that will take in flavors easily. The end result will be as true a taste to the tofu marinade as you can get. Best to use firm or extra firm tofu for marinating as they have the ability to keep their shape. Once you have drained and pressed the tofu, it is ready for your marinate. Let it soak in your marinate for at least 30 minutes before cooking. Check out Beth’s recipe and wonderful tutorial on how to properly fry tofu for the best taste. Visit her at Budgetbytes.com. She does an incredible job! Pan fried is one of the most common ways of cooking tofu as it is easy, quick and has only minor clean up. What does tofu taste like fried? Pan frying will give your tofu a super crispy crust that delivers flavors to your pallet not unlike when you sear a steak or brown a roast. You can even up the crispiness by using cornstarch on it. When pan frying you just use a small amount of oil in the pan, so it really is not like deep frying at all. After you add the tofu to your pan, be sure to brown all the sides of each cube. Once all sides have been browned then remove from the pan and let cool on a cooling rack for maximum crispness. These are best served as quick as possible as they will lose their crisp shell after a little time. Crispy tofu tastes the best. Refrigerating them after cooking will make them chewy and lose any crispness they had. Lose the crispiness, and you lose good tasting tofu. Stir-frying is very similar to pan frying only it is done in a wok instead of a pan. You would follow a lot of the same procedures as you would with pan frying such as the cornstarch for the crispy outer shell and the oil used to line the bottom and lower sides of the wok. You can add vegetables to your stir fry or other ingredients, and if you did not marinate your tofu, then it will take on the flavors of whatever you are stir frying it with at the same time. You want to fry up the tofu first and then remove it from the wok. Then stir fry your other ingredients and then place the tofu back into the wok once it is closer to be completed. 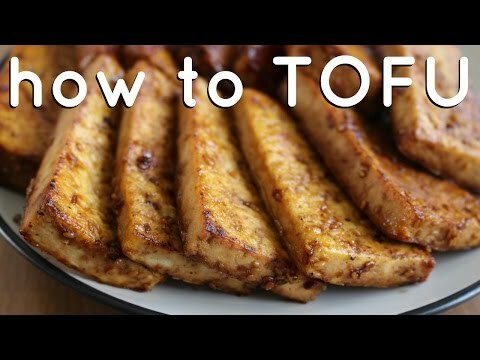 Kate, from CookieandKate.com offers some amazing tips on how to bake tofu for yummy crispiness. You’ll be glad you followed her steps! Baking tofu can be an amazing thing. What does tofu taste like baked? Crispy outside and creamy inside make for an irresistible combination in your mouth. Baking tofu is easy to accomplish. Starting with some extra firm tofu cut into cubes, you would arrange your tofu on a baking sheet trying to avoid any pieces touching each other. Bake for 20 to 45 minutes depending on how thick you have made your cubes. You can toss the pieces every 10 minutes or so to ensure even baking. Baking makes the tofu chewy to eat and can be eaten right away from the oven or kept in a refrigerator to be eaten as a tasty snack at a later time. Everyone likes a good BBQ, and tofu can definitely rise to that challenge. One good approach is grill it kebab style on a stick with other vegetables like tomato, peppers, and onion. Cut your block into 1-inch cubes or larger. You can choose to marinate them, or you can let the BBQ juices from the other vegetables create your flavors. Place your cubes on kebab sticks with your other ingredients, and you can grill them right on the BBQ. Add some BBQ sauce for that additional kick. If you want to just throw some tofu blocks on the grill, that can work well too. 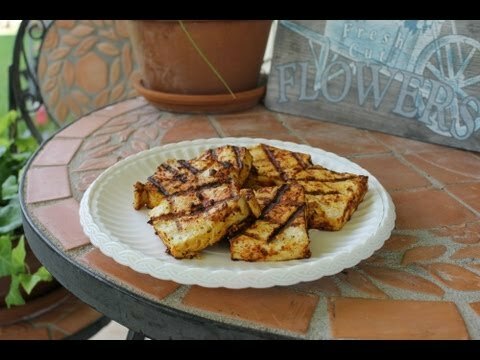 Check out the video below where the point is made that if you season tofu the right way, you can make it taste great grilled. So what exactly does tofu taste like? From everything we’ve laid out above you’ve learned it can taste like whatever you want it to taste like. Your tastes are limited only by your imagination and how you apply to cooking tofu.